Delivering Seat-of-The-Pants Proven Performance with NO Gueswork... To get great performance out of any engine, the components must work together. 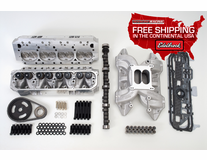 Since the early 1980's, the Edelbrock Total Power Package System has solved the parts matching puzzle for many street performance enthusiasts. 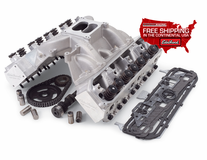 intake manifolds, camshaft kits, cylinder heads and carburetors are the core of the Power Package and can be purchased one piece at a time or in a single box with our popular Top End Kits. The Edelbrock Total Power Package® concept of selling dyno-matched components has been popular since the 1980s, but with the introduction of the Performer RPM Power Package Top End Kits, Edelbrock matched parts are now available under one part number! Our Top End Kits have been a huge hit due to their all-in-one-box convenience and "no guesswork" performance appeal. With just about everything you need to top off your Mopar, these Top End Kits are performance-proven. 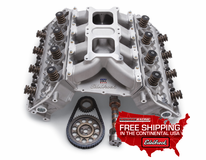 EDELBROCK'S TOP IT OFF PROMOTION Purchase any NEW Edelbrock Total Power Package Top End Kit and Edelbrock will give you a FREE Thunder AVS or AVS2 Series carburetor, up to a $350.00 value! In order To qualify for a FREE Thunder AVS or AVS2 Series carburetor, you must purchase a new Edelbrock Total Power Package Top End Kit between October 1, 2018 to December 31, 2018, complete the redemption form as directed, and mail it in by January 31, 2019. 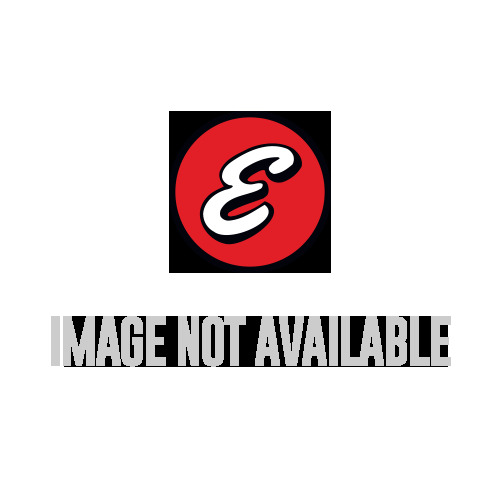 426-572 Chrysler HEMI (Gen II) - 705 hp & 620 ft-lbs.